We just released a detailed video to introduce all our electronic add-ons, including all the basic add-ons which are compatible to all our current Iron man costume suits and all the future ones and advanced electronic add-ons which are now only compatible to the Mark 4 suit and the Mark 6 suit. Now enjoy the video please. This entry was posted in News,Iron Man Suit Mark 4 IV Wearable Armor Costume R&D Full History,Iron Man Suit Mark 6 VI Wearable Armor Costume R&D Full History and tagged Iron Man armor set news,Iron Man costume news,Iron Man replica news,Iron Man suit news on Jun 18,2014. We have finished the development of the Iron Man costume suit Mark 4, but we still need some time to take photos and upload all the product information to website. Since 90% components of the Mark 4 suit are the same as those of the Mark 6 suit, we will release a 2 in 1 Iron Man costume package in addition to the stand alone Mark 4 suit. The Iron Man suits Mark 4 and Mark 6 only have two different parts: the front chest and the thigh. The Mark 4 has a round Arc Reactor design while the Mark 6 has a unique triangle design. And their thigh parts have the same surface structure but different in color scheme - the Mark 4 has a red - gold thigh while the Mark 6 has a pure gold thigh. Therefore we developed a interchangeable structure for both suit which means you only need to buy an additional front chest and a pair of additional thigh you actually get two suits. We even take into consideration of the electronic add-ons so that you only need to purchase an additional round / triangle Arc Reactor attached to the front chest part. 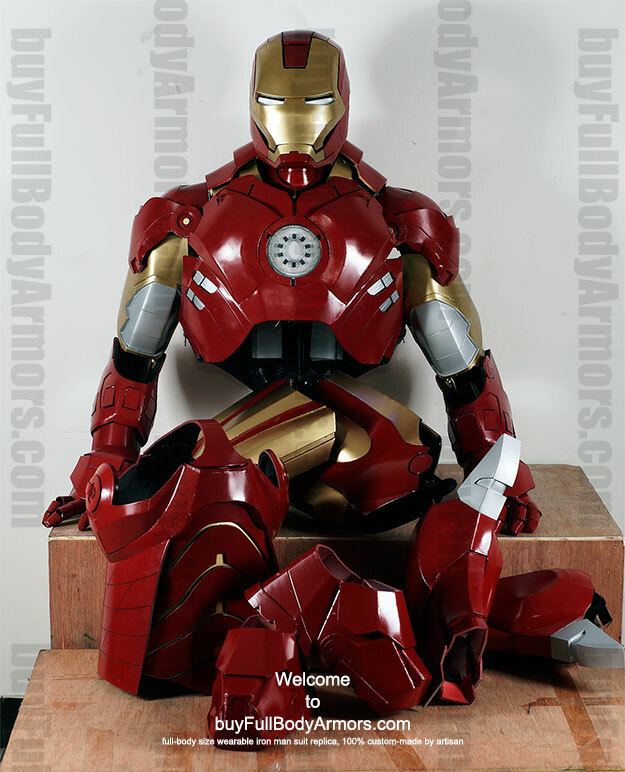 This entry was posted in News,Iron Man Suit Mark 4 IV Wearable Armor Costume R&D Full History,Iron Man Suit Mark 6 VI Wearable Armor Costume R&D Full History and tagged Iron Man armor set news,Iron Man costume news,Iron Man replica news,Iron Man suit news on Jun 13,2014. All Iron Man suits retains Iron Man's signature Repulsors in the hands. In the Iron Man movie, The Hand Repulsors can be used as weapons with its very famous power recharge sound effect. We have provided two options in basic electronic add-ons section for all our current available Iron Man costume suits and will include them in all our future Iron Man suits - one is merely simple LED plate with no sound effect while the other option is far more advanced with lights intensity change control and sound effect. Visit our current available Iron Man costume suit ordering page to see these two features. The hand Repulsor is designed as the same as that in the movie. After you activate a Hand Repulsor, the intensity of the Repulsor LED lights rises to a peak then dim to normal level along with the sound effect from the movie. The left and right Hand Repulsors are separately controlled. There is no need to select Hand LED lights option any more if you select this option. This entry was posted in Electronic,News,Iron Man Suit Mark 4 IV Wearable Armor Costume R&D Full History,Iron Man Suit Mark 6 VI Wearable Armor Costume R&D Full History,Iron Man Suit Mark 6 VI Wearable Armor Costume R&D Milestones and tagged Iron Man armor set news,Iron Man costume news,Iron Man replica news,Iron Man suit news on Jun 09,2014. The major features of the Iron Man costume suit helmet are the iconic Eye lights and the motorized face plate. We have provided these two features as options in basic electronic add-ons section for all our current available Iron Man costume suits and will include them in all our future Iron Man suits. The activation status of the Iron Man helmet Eye lights and the open-close status of the helmet face plate are opposite which means only when the face plate is closed the eye lights will be turned on and when the face plate is opened the eye lights will be turned off. We also designed a blink effect before the eye lights are turned on completely. This entry was posted in Electronic,News,Iron Man Suit Mark 4 IV Wearable Armor Costume R&D Full History,Iron Man Suit Mark 6 VI Wearable Armor Costume R&D Full History,Iron Man Suit Mark 6 VI Wearable Armor Costume R&D Milestones and tagged Iron Man armor set news,Iron Man costume news,Iron Man replica news,Iron Man suit news on Jun 08,2014.